A set of children's outfits for Halloween has been withdrawn from sale by Poundland amid safety fears. The budget retailer said checks on the witches hat and playset revealed a small number of chemicals classified as unsafe for young children. It said only a small number of products were affected and the recall was a precautionary measure. Anyone who has bought them should stop children wearing them immediately and return them to the store. In a statement, the retailer said: "Poundland is committed to the highest levels of product quality and safety to ensure the protection and well-being of our customers." The products were on the shelves ready for Halloween on 31 October. 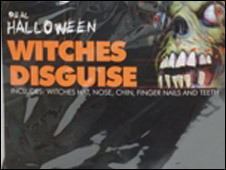 The affected products were the witches hat and playset, the "kids' Halloween pirate mask", and the "kids' Halloween mask and hood". Poundland has apologised for any inconvenience and stressed that every item sold at its stores undergoes "rigorous testing". Anyone with concerns can call a free customer services number on 0800 731 5622 between 0900 and 1700, Monday to Friday. How do pound shops cope with inflation?